The Home-Run Bat in Super Smash Bros. 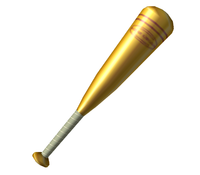 The Home-Run Bat (alternatively spelled Homerun Bat) is an extremely powerful item in the Super Smash Bros. series. Fighters can grab the bat and use it to hit other fighters or throw it at them. The smash attack of the Home-Run Bat is very powerful and deals a large amount of knockback (on normally-sized stages, enough for a one-hit KO), but takes a long time to execute. It launches players the farthest when hitting with the tip of the bat. In Super Smash Bros. for Nintendo 3DS / Wii U, the Home-Run Bat reflects projectiles. While the Home-Run Bat does send opponents flying diagonally for most characters, the item operates differently for Captain Falcon and Sheik, but only in Super Smash Bros. Melee; the two will send foes flying upwards with their Home-Run Bats, instead of diagonally. In Super Smash Bros. Brawl, the Home-Run Bat has different animations for each of the different characters. For the first three Super Smash Bros. titles, the Home-Run Bat takes the appearance of a normal wooden baseball bat. In Super Smash Bros. for Nintendo 3DS / Wii U and Super Smash Bros. Ultimate, the bat is given a redesign: the main part of the bat is black and yellow, while the handle is red and golden. The Super Smash Bros. emblem also appears on it in gold on the handle end of the bat. The Home-Run Bat is also used in the Home-Run Contest mode since Super Smash Bros. Melee. To unlock the Home-Run Bat trophy in Super Smash Bros. Brawl, the player must hit the Sandbag in the Home-Run Contest at least 500 meters. A similar bat can be found in Paper Mario: Sticker Star, as one of the many objects the player can find in the game. N64 Super Smash Bros. A battering item. Smash a foe with this and be rewarded with the distinctive "KREEEEENG!" sound of a home run as your foe goes flying. The sound echoes with what's surely the timbre of supreme bliss. For the character being hit, though, it must be one of the scariest sounds ever. But it's not easy to use--it swings slowly and has a limited range. High risk, high reward. Wii U Super Smash Bros. for Wii U Combine this black bat with a forward smash to try for a home run, using an opponent as the ball! Unfortunately, the reach on the bat is not all that impressive, so it takes some real skill to line up a hit. Keep your chin up, though—the loud "KREEENG" of a hit makes it all worthwhile. This page was last edited on December 15, 2018, at 09:00.